My family is basically from a middle class background. It all started on 15th jan 2016, when my husband(P.Mahendar) got severe headache due to High Blood Pressure. And on medical test, we came to know about the kidney damage due to High Creatinine level in the blood.Immediate dialysis was needed so we admitted him in Apollo Hospital as this hospital has JeevanDhan scheme which provides fast organ donors. This dialysis has to be done thrice a week which is costing Rs.3,770 per day .Being a private employee with 2 kids, we sold whatever gold, our flat and the small amount we saved . This is happening since 2 years,because the blood group of my husband is O+ve and we are yet to receive a donor for the kidney. But all of a sudden, My husband got into severe shock due to accelerated hypertension with Intracranial bleed(internal bleeding) in brain. 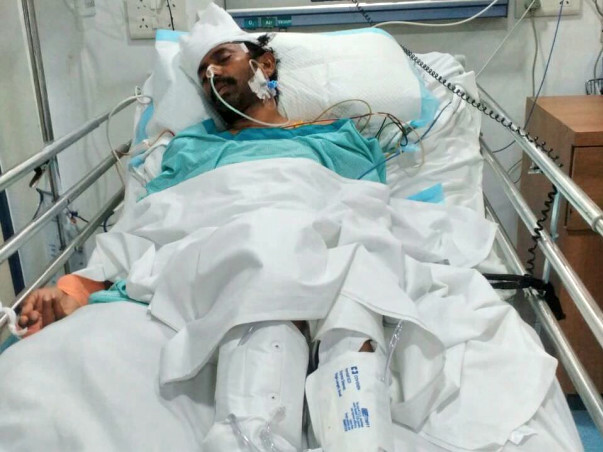 Currently he is on ventilation and has to go through brain surgery and kidney transplant which would cost Rs.9,75,000 for kidney transplant and it is Rs. 6,45,000 for brain surgery. We are beyond helpless in this situation. So please help me to get back my husband back to life and save my kids's future. For any queries, Please do not hesitate to contact Apollo Hospital Jubilee Hills patient name P. Mahendar( 43 M). I would be ever grateful for every little help that comes our way. His brain surgery was done and was discharged a week ago. Unfortunately, his kidneys have stopped functioning now. Hence, the doctors put him on dialysis every alternate day. Dialysis will continue till we are able to find a kidney donor for him, belonging to O positive blood group. Thank you all for your valuable support because of which we have been able to come this far. Please keep supporting him. Thank you for the support that you have shown towards my husband Mahendar. He is doing comparatively better compared to earlier. He undergoes dialysis thrice every week. As he had a brain stroke in February and is currently taking treatment for hypertension the doctors have advised us to postpone the transplant procedure by about two months. Once his health stabilises and he recovers well they will be suggesting the transplant date. this will also give us some time to look for a suitable donor who will be donating one kidney to him. Thank you all once again. Please do pray for his health and speedy recovery. Would request you to please share this campaign further with your friends and family to help us in raising funds towards his treatment. Will keep you posted.